I suppose when most people think of Polish classical music, they think of Chopin or polonaises. The polonaise of course is a dance – one of the country’s five national dances, though it’s actually the French word for “Polish”. Apart from Chopin, you might be hard-pressed to think of any other nineteenth century Polish composers. Henryk Wieniawski springs to mind, because he wrote many works for violin and his Second Violin Concerto remains popular. Then there was Moszkowski, who was a big name in the late nineteenth century, best known for his piano music. We mustn’t forget Paderewski either, who was a world-class pianist in his time and had the distinction of being Poland’s Prime Minister for just ten months. He achieved sufficient musical fame to have a star on the Hollywood Walk of Fame in Los Angeles. But this brings us well into the twentieth century, when Poland produced a crop of composers who have achieved international recognition. In 1992, a recording of the Symphony of Sorrowful Songs by Henryk Górecki (goo-RETS-kee) topped the classical charts in Britain and the United States selling more than a million copies. The most influential twentieth century Polish composers include Karol Szymanowski, Leopold Godowsky, Andrzej Panufnik, Witold Lutosławski and Krzysztof Penderecki. The last name (pronounced, usually with difficulty as KZHISH-toff pen-der-ETS-kee) may be more familiar because his highly personal and sometimes downright scary music was used in several movies, notably The Exorcist (1973) and The Shining (1980). One of his most influential works is the musically-challenging Threnody for the Victims of Hiroshima, which was used in the movie Children of Men (2006). The two works this week are in total contrast, the first stylistically rooted in the closing years of the nineteenth century, the second firmly in the twentieth. They’re as different as chalk and słupski chlopczyk. Etudes, the French name for studies, were usually written for piano and emerged during the early nineteenth century as the instrument was growing popularity. They were originally short exercises intended to develop a particular instrumental technique. Most pianists have been obliged to struggle through the studies of Clementi and Czerny but two composers, Chopin in Poland and Liszt in Hungary raised the étude to a high art form. 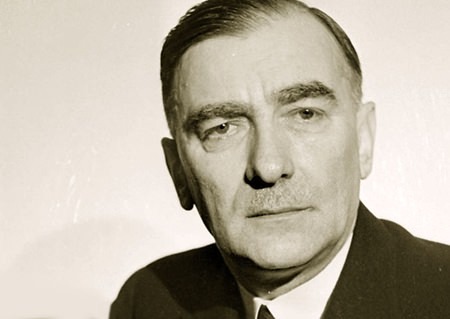 Szymanowski (shih-ma-NOFF-skee) composed his four études for piano between 1900 and 1902 when he was still influenced by German romantic music of the late nineteenth century. He wrote a staggering quantity of music including several concertos and four symphonies. After hearing the third symphony, his younger compatriot, the composer Witold Lutosławski remarked that he felt “quite dizzy for a number of weeks”. The third étude is slow and lyrical and has become the most popular of the set. It was performed by leading pianists of the time and brought the composer considerable fame, especially after it was orchestrated by the Polish composer and conductor Grzegorz Fitelberg. The piece has rich confident harmonies and a lovely nostalgic melody which draws the music to a dramatic climax (at 03:50) before the tension begins to subside towards its reflective conclusion. You’ll probably notice some quite dissonant harmonies towards the end; a hint perhaps of Szymanowski’s more mature musical style. Witold Lutosławski (VEE-tolt loo-to-SWAHF-skee) is considered one of the great voices of Polish twentieth century music, although he was relatively unknown outside the country until the 1960s. His early work shows the influence of Polish folk music although his first symphony was banned during the Stalinist era on the grounds that it was too “formalist”. This was a favourite term by the censorship authorities of the day and referred to the half-baked political notion that music should be simple and accessible to the masses. Lutosławski used an approachable, more tonal style for his popular Concerto for Orchestra which dates from the early fifties. The work opens with a reminder of Brahms’ First Symphony and there’s plenty of percussive pounding and dissonance, but also moments of opulent harmony with tantalising fragments of folk-song. It’s brilliantly scored for a huge orchestra with a large percussion section as well as a celesta, a piano and three harps, though for some reason this performance uses four. By the end of the 1950s the state loosened its grip on artistic creativity and Lutosławski was free to explore more challenging approaches to composition. Towards the end of his life, he was awarded the Order of the White Eagle, Poland’s highest honour. And in case you’re still wondering, slupski chłopczyk is a kind of Polish cheese. I didn’t make the name up. Honestly.